Today, Michaela, is your birthday. I was just sitting here praying for you, and I was praying that wherever you are that God would put his arms around you and hold you ... and that brought to my mind the saddest picture ... of you alive somewhere, knowing it is your birthday, feeling like nobody cares. And I prayed that wherever you are, God would allow you to feel my arms around you, to let you feel my love. Do you think that you are forgotten? You are not. On this day, for the last 26 years, I have remembered you in various ways, but I have never forgotten you. I have never forgotten the gift that I received on this day 36 years ago. I have written before in these many blogs about this, but never, ever doubt Michaela, that I am glad you were born. I rejoice in you. The gift you were to me then, and honestly the gift you continue to be to me now. Even on the darkest roads I have walked in my grief, you are a shining light in my heart. My love for you is great and huge, overcoming any attacks with its power. So for me, there would be no other choice. I would always choose to have you, to know your softness, your sweetness, to hold you and feel your heart beat against mine, a heart that was purely kind. For you, Michaela, for your sake, the story might have been different. If I had been told, before you were born, how YOU would suffer in this lifetime, it is most likely I would have sacrificed my own joy for your sake. I would have chosen to spare you that, even if it meant I would never get to hold you, even if it meant that I would walk through this life without your light in my heart. It always comes back to that, Michaela. Every last little bit of my own suffering is tied in with your suffering. It is impossible for me to separate my own grief at missing you from my overwhelming grief over what you have had to endure, what you may still be enduring. But I didn't know the suffering life would hold for you, and on the one hand I am so sorry I didn't ... but on the other hand ... well, my friend Margo introduced me to this song not long after you were kidnapped, and it has always stuck with me. Holding you, I held everything. Our lives are better left to chance. but I'd have had to miss the dance. If you are on this earth, if I knew where you were, I would come to you.You are 36 years old today, actually two years older than I was when I lost you. What years we have missed sharing. And yet I can tell you that between that age and the age I am now, entire epics have been lived. There is so much yet that we can share. There is so much ever loving, pure joy to be shared! There is so much love. And your family! I wish you could meet Libby. She has grown up to be so kind, and so gracious. Whenever I had to go to social events where I might feel awkward, I would try to take Libby, because she has such a gift for making people feel at ease, for making people smile. She went and moved to Oregon, so now I can't do that, but she would come back for you! She and Johnna would both love to take you shopping! And wouldn't you like to go to Disneyland? If you are alive on this earth somewhere, just know that you are so everlastingly dearly loved! On your birthday and every single day, you are loved, you are remembered, you are cherished. And if you are not on this earth ... well, I know you are in good company, and I will see you again one fine day. Aw, Happy Birthday Michaela! I hope you have a good day where ever you are. Michaela actually shares a birthday with missing child Jenna Ray Robbins. (Does Jenna have any relatives actively searching for her?) I hope both cases are solved soon. And Kevin Collins. I remembered them also on Muchaela's Facebook page. Thank you Sharon for always sharing Michaela with all of us here on facebook and around the world. I'm still praying and believing for a miracle for Michaela and your family. I will not lose hope. My heart goes out to you and your family in a great way. I pray for God to hold you very close to His heart and you will feel the warmth of His great love for you, and I pray you will sense and feel the great love, warmth, and care of your Mom and family today. I'm praying and believing for you to come home to your Mom and family and I would love to meet you. Michaela, there are lots and lots of people all over the world who are praying for you and love you so much. Why do children have to be victims of kidnappings or presumed kidnappings? When a child goes missing in the U.S, whether it was witnessed or not, the family always start to fear the worst. And that is every parents' worst nightmare. And they can stay missing for years and years. And those cases may touch more people than others. Why do some of the innocent children end up being pulled in a car and then maybe killed and buried in a backyard? Why steal their lives from them? Michaela is one example, she was just a little girl who had still so much to learn and do in her life. And one guy just took her away and to this day somehow has been able to stay unknown. With that been said, I felt sad on Michaela's birthday, in a spot of my mind, but now I just feel bitter. She should be among us, should've always been. This shouldn't be the case. I bought a cupcake on Michaela's birthday. When I blew out the candle, my wish was that she is at peace wherever she maybe & that one day her family may have answers and some sense of closure. 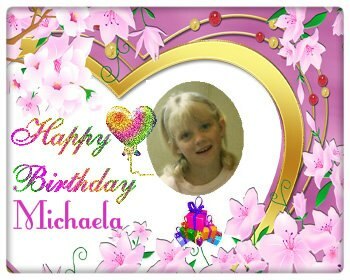 happy birthday and all the best to michaela. The guy who took a way michaela -please talk and tell what happen.